Francis de Sales was born of a noble family on August 21, 1567, near Annecy in what is now France. As the eldest of thirteen children and heir to the family name, he was destined to a career in the service of the state. He studied in Annecy, in Paris, and finally in Padua where he took a doctorate in law to please his father and one in theology to please himself. He wanted to be a priest. His father wanted him to be a lawyer. With his mother’s encouragement, Francis was ordained in 1593. Although he became bishop of Geneva in 1602, his cathedral and residence were in Annecy because at that time Geneva was a stronghold of Calvinism. 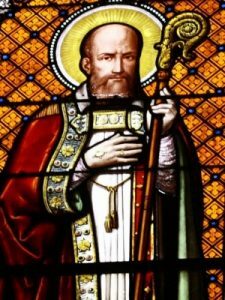 He spent his life in the service of the people of his diocese, particularly in preaching and giving spiritual direction. He wrote two classics of spiritual literature, and in 1610 with Jane Frances de Chantal founded a new religious congregation, the Sisters of the Visitation of Holy Mary. He died at the age of fifty-five in Lyons, France, on the Feast of the Holy Innocents, December 28, 1622. In addition to his personal ministry, he wrote many letters; over two thousand are extant. He organized his letters of spiritual direction into a book called The Introduction to the Devout Life, the first handbook on spirituality for the laity. He later published the Treatise on the Love of God which describes the development and growth of the love relationship between God and human beings. During his lifetime, Francis touched the lives of thousands of people with his wise and loving counsels, and his writings have extended hope and consolation to countless others in the centuries since his death. Today he is still a sure guide for those who have discovered his gentle, sublime, yet realistic approach to God. Francis teaches cheerfulness, optimism, and inspired common sense; his readers can experience something of that divine love and hope which are characteristic of this lovable saint. His words are tender and sincere, as if he were talking to a loved and long standing friend. His published books are quite long by today’s standards, but his ideas are stated in sentences that were fairly short for his era. He drew images from all around him in real life as well as from books which taught the knowledge of his times. His shorter inspirational gems, even removed from their settings, retain their meaning and inspiration. Francis emphasized the need for inner conversion; actions always follow the leadings of the heart. He acknowledged that busyness and a hectic lifestyle are normal for most people and are not themselves obstacles to a “devout life”; it is only necessary to seek God in each moment in order to find God. Jane Frances de Chantal was born in Dijon in 1572. She was the second child of Benigne Fremyot, president of the local parliament. Her mother, Marguerite Berbisey, died when Jane was eighteen months old. Her father then assumed the task of Jane’s education. In 1592, he arranged for the marriage of Jane to the young baron, Christopher de Rabutin-Chantal, the son of a friend. Since Christopher spent much of his time in the king’s service at court, Jane became the one responsible for the rearing of their four children as well as for the management of the estate at Bourbilly. Their happiness was short-lived since Christopher died after a hunting accident in 1601. It took years for Jane to forgive the man who had caused his death. To safeguard the inheritance of her children, Jane then lived with her father-in-law, his mistress, and their children at Monthelon. Though the immorality of this lifestyle distressed Jane, she was gracious to the mistress, even to the extent of educating her children. In 1604, Jane’s father invited her to the series of Lenten sermons preached by Francis de Sales, the Bishop of Geneva. This was to be a milestone in Jane’s life. As a mother and mistress of an estate, Jane had been popular among her employees and servants who recognized her fairness and interest in their welfare. She often cared for the sick and fed the hungry. She put the needs of others before her own, often depriving herself of much needed rest. Managing an estate was taxing and exhausting work, demanding her attention from morning to sundown. Still, the education of her children and their welfare always was her primary concern. In all of this, Jane is a good example to lay women in today’s world who often find themselves forced to handle many tasks at once. If they look to Jane, they will realize it can be done. Holiness is attainable in the busyness of everyday tasks. At their first meeting Jane saw that Francis was the director promised by God during a dream, and Francis recognized Jane as the co-worker he had seen during a vision. No wonder then that Jane placed herself under his spiritual direction. 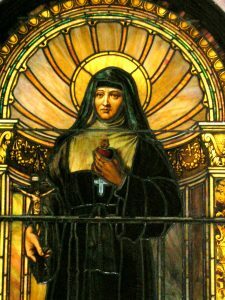 Francis de Sales immediately released her from the rigid lifestyle of her previous director by encouraging her to “do everything through love and nothing through constraint.” He urged her to find God in the loving fulfillment of her duties in life. This gentle guidance transformed Jane. By 1610, Jane had arranged for the future of her children. Charlotte, the youngest, had died. Celse-Benigne, her only son, was becoming a page in the court of the French king, and Marie Aimee, the elder daughter, was marrying Bernard de Sales in Annecy. Francoise would complete her education under the tutelage of her mother in the Visitation Monastery to be founded by Francis and Jane in Annecy. A family council met to permit Jane to enter religious life. The chronicles say that Jane had to step over the body of Celse-Benigne who did not want to see her go. This caused Jane intense grief but she felt very strongly that God had called her. The day to day operation of the order fell to Jane. Even after Francis died in 1622, Jane continued founding monasteries of the Visitation throughout France. But she never neglected her children. She arranged marriages for all of them and then assisted in the setting up of their households. Marie Aimee, already engaged to Bernard de Sales, was widowed early in her life and died soon after giving birth to a stillborn. She received the Visitation habit on her deathbed. Celse-Benigne, who married Marie de Coulanges, died in battle at the age of thirty-one as a result of more than 27 stab wounds. His daughter became the renowned Madame de Sevigne. Finally, Francoise married Antoine de Toulongeon, a wealthy man some fifteen years her senior. Francoise was rather worldly in her ways and preferences. In Jane’s correspondence with Francoise, she encourages her daughter to pursue a life of moderation rather than one of self-indulgence. In the end, Jane outlived everyone that she dearly loved and cared for except Francoise. Although she had always longed for a quiet, contemplative existence, she never enjoyed this experience. Her own religious daughters elected her to be their superior over and over again. She also was involved in establishing new monasteries and in revisiting well-established ones to ensure that the true spirit of the Visitation was alive in them. In 1641, Jane de Chantal died while visiting the Visitation Monastery in Moulins, France. On her deathbed, she encouraged the assembled sisters of that community to remain constant in their vocation of living Jesus. She died in peace, asking for nothing and refusing nothing, thus demonstrating even in death her loving and lifelong fidelity to the Rule of Life given her by Francis de Sales.